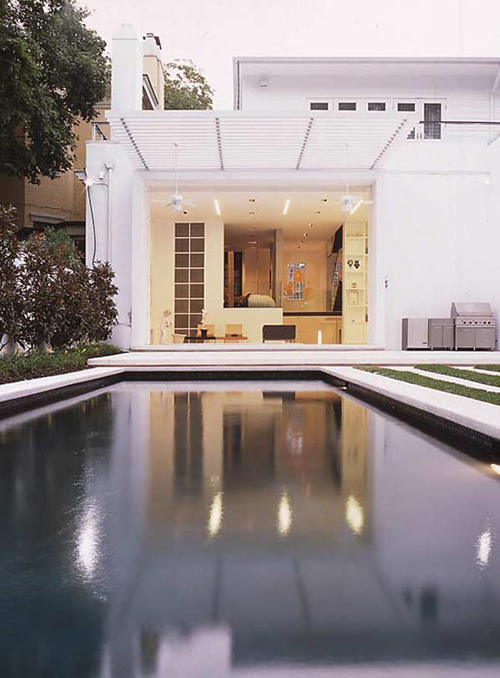 A renovation of an existing residence located in the Georgetown neighborhood of Washington, DC, the Levinas Residence landscape includes a series of new garden spaces, a walled court, and a new swimming pool terrace. The design is conceived as a series of enclosed gardens intended primarily for relaxation on a day to day basis, but also capable of hosting social events and acting as an open-air museum for the display of the owner’s large collection of outdoor sculpture. Conceptually, the site is divided into three distinct zones. On the west, a pool terrace includes a long lap pool that is oriented in such a way that, when unoccupied, it serves as reflecting pool from within the residence. A turf terrace adjacent to the pool has a space for outdoor grilling and entertaining. Bands of paving inserted into the turf in this area create a distinctive pattern and blur the distinction between hardscape and conventional turf. The central garden is a walled courtyard, enclosed by high walls, that serves as a more formal outdoor entertaining space. Tall gateways lead to the pool terrace and the sculpture garden. The sculpture garden, on the east side of the property, is organized by a grid of columnar trees set in a decorative gravel surface. The space hosts a revolving exhibition of the owners’ larger pieces.